Go back to the beginnings of dc Talk and discover the boldness and originality of a band that has continued to grow and re-define Christian music. Since releasing their album Jesus Freak, dc Talk has emerged as a leader in the pursuit of melding rock 'n' roll with provocative questions of faith. Numerous Dove Awards, four Grammy Awards, two platinum albums, one gold album, and two gold-certified long-form videos and with seven million albums sold, attest to the group's ability to bridge the gap between religious and secular audiences. "We are very open about our Christian faith," says Toby McKeehan, "but when we make our records we want to create a musical experience that anyone can immerse themselves in. One of our goals is to encourage listeners to question themselves and to seek out truth." They authored the books, Jesus Freaks and Jesus Freaks Volume II: Stories of Revolutionaries Who Changed Their World Fearing God, Not Man, launching them into a new media form - challenging readers to question their own standards of faith and dedication - impacting the world like never before. 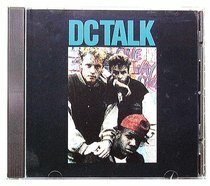 In addition to their recordings, live performance has been a crucial part of the dc Talk story, and the group's fiery on-stage delivery earned them respect from virtually all quarters. Whether forging strong bonds with concert audiences, or expressing their faith in the recording studio, dc Talk strives to treat their listeners as equals, rather than receptors. McKeehan says, "We want to make music that encourages people to think about the things we think about,spiritual issues and truth." Max adds, "Just as we all share the idea of caring and conscience, we also share the hunger to find truth and meaning in life." - Publisher.